The federal “tipped minimum wage” for restaurant workers is $2.13 an hour. What that means is that in the United States of America, if you have a job in which you rely on tips for a living — for instance, as a server or busser in a restaurant — employers are required by law to pay you just $2.13 an hour. The rest of the difference between $2.13 and the standard minimum wage you presumably make up for with tips. But if you do not earn enough in tips, good luck trying to get your boss to fork over the difference. More than 60% of low-wage workers have been victims of “wage theft,” in which employers do not pay the wages due, and tipped workers are most likely to be subject to this practice. According to The Economic Policy Institute, low-wage workers are also literally robbed more often than banks, gas stations and convenience stores combined. That is in addition to the injustice inherent in the minimum wage law itself — the federal tipped minimum wage of $2.13 an hour has not been raised one single penny since 1991. Wages are only one of the problems facing America’s low-wage restaurant workers. Almost 90% of them do not have access to paid sick days, which is not only bad for those workers and their families but also for the other workers and customers in restaurants. Who wants to eat food cooked by someone who has the flu or worse? Moreover, many restaurant workers face sexual harassment and discrimination on the job — including in the handing out of promotions, which research has shown go disproportionately to the white people working in restaurants. Combined with sub-minimum wages and wage theft, it is clear that as hard as restaurant workers across the country work to put delicious meals on our tables, the portrait of their working conditions is horribly dark. There is another way. Restaurants that have chosen to take the higher road and fix their unjust pay and employee practices have found that they have lower turnover rates and higher customer satisfaction. In fact, better business practices in the restaurant industry can reduce employee turnover by almost half. Meanwhile, raising the minimum wage does not hurt economic growth but instead, if anything, appears to have a positive effect. The seven states that have already abolished the sub-minimum wage — Alaska, California, Minnesota, Montana, Nevada, Oregon and Washington — have seen above-average employment growth. 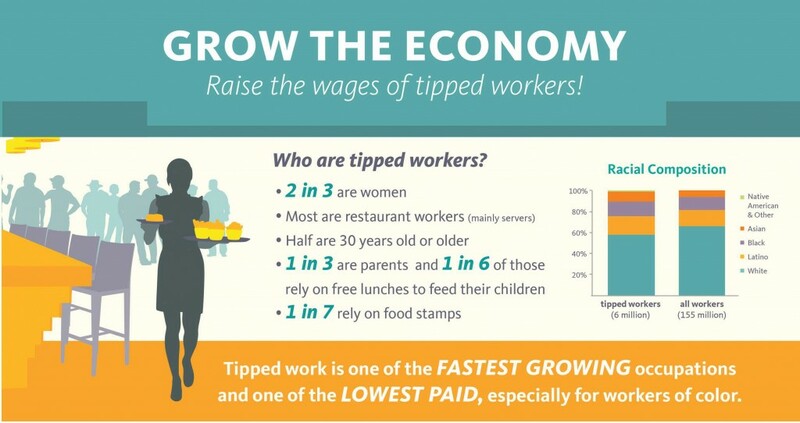 In addition, per capita restaurant sales increase as the tipped minimum wage increases. Raising the minimum wage is not just good for restaurant workers, it is good for restaurant owners, customers and our entire economy. That is what Peter Ellis, who owns the restaurant El Fuego in Philadelphia, recently went to Washington, DC to personally tell members of Congress — that raising the minimum wage is good for restaurant workers and business owners like himself. “Two of my workers are single mothers, and if their kids’ daycares are closed for a day so that they can’t go into work, they shouldn’t be punished by not making a salary for that day,” said Ellis. “I have a wife and a kid, and I know that if my kid’s daycare is closed, I can go home, no problem, but other people can’t just because of their circumstances, and that’s not fair.” Instead, Ellis is part of a growing movement of employers who know that good wages and good labor practices make for good business. Sometimes the right thing to do is not the easy thing to do. But not in this case. Finally increasing the federal sub-minimum wage, thus giving all tipped workers a much-needed, well-deserved and long-withheld raise, will help thousands of American families escape desperate poverty while putting more cash into the hands of consumers who will spend it, rather than allowing fast-food chain CEOs to just hoard it. Plus, everyone in America benefits from restaurants that are healthy and sustainable, in every sense of the word.